Metabolic status of dairy cows influences reproductive tract and fertility in postpartum period. A study with 89 estrus dairy cows was performed to study the relationships among the concentration of metabolic hormones and ultrasound traits of genital system in heat dairy cows. Cows in estrus were examined with transrectal ultrasonography and palpation, and their blood samples were collected nearly to the time of insemination. Ultrasonography images of the uterine horns, ovarian follicles, and corpus luteum were recorded and interpreted. The concentration of insulin-like growth factor-1 (IGF-1), non-esterified fatty acids (NEFA), and β-hydroxyl butyric acid (BHBA) was determined in the serum samples of estrus cows. This study indicated that the correlation between ultrasound traits of uterus and metabolite hormones was not significant at the clean test in estrus dairy cows. 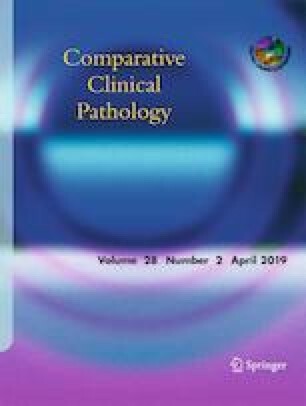 Moreover, there was no relationship between serum level of IGF-1, NEFA, and BHBA with either dominant follicle diameter or existence of corpus luteum (CL). Significant association between ultrasound properties of the uterus and ovaries and metabolic hormone (IGF-1, NEFA, and BHBA) concentrations did not reveal in estrus dairy cows at day 28 ± 3 postpartum. The authors would like to thank the Research Council of Shiraz University and the School of Veterinary Medicine, Shiraz University for technical support and the Pegah Dairy Farm for their logistical cooperation. This study was supported by the School of Veterinary Medicine, Shiraz University (grant number 94GCU2M154630). The study was conducted under the confirmation of the government commission on animal ethics, Shiraz University, Shiraz, Iran (IACUC no: 4687/63). Moreover, the protocols of European Council Directive (2010/63/EU) of September 22, 2010, about the safekeeping of animals considered for empirical objects.